I Love Las Vegas. One of my all-time favorite destinations. 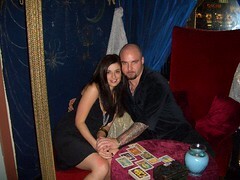 This fortune teller told me who I would marry and he was quite convinced and convincing. Las Vegas is one of my all time favorite destinations. I love Vegas. My first trip to Vegas was when I was 23. I was with my father and his friends and we stayed at the Flamingo. I would separate from the old folks and sit down at a Roulet table alone to play for a while. When I was good & liquored, I would order a cigar from a waitress and light up. Fast forward an hour or so... I am hammered, up a little bit of money and enjoying my Romeo y Julieta, or maybe it was a Hemingway Short Story. In walks my dad and ALL of his friends. I was sitting alone, a pile of chips in front of me and mortified at the sight of my father. I sat there starring back at them with a 1/4 of a lit cigar dangling in my mouth. They all laughed at me and walked on. That was the beginning of the end. Since 1995, I've averaged about 3 tirps a year to Vegas. I've stayed in just about every hotel, including The Aladdin, right before they changed to a Starwood Property. The Aladdin was the worst Vegas property I've ever, EVER, stayed in and I would say that The Four Seasons is my favorite in Vegas. Well, I'd say The Four Seasons is my favorite any where. I hear the Four Seasons in Kabul is particularly nice. The photo above was taken a few years ago, it was a girl's trip. I was with my friend "E". E and I travel together well as we enjoy the same things. We wake up and go down by the pool where we will take our breakfast. I never have a cocktail before a swim, once my laps are swam, cocktail time begins. A few hours in the sun and we head upstairs, get cleaned up a bit and go back down to the Spa. Perhaps a short nap after the spa and we are up and ready to head out to dinner. Dinner is always an event, in the year that this photo was taken, we had a fantastic dinner at Craftsteak in the MGM Grand. I was lucky enough to indulge in the Waygu Beef fillet that was flown in from Australia. TO THIS DAY, I recall this steak, in fact, I can taste it as a type. After dinner, perhaps a little gambling and a cocktail in one of those cheesy lounges. Nightclubs not really for me.